The fascinating story of the rediscovery of the lost techniques of ancient goldsmiths. 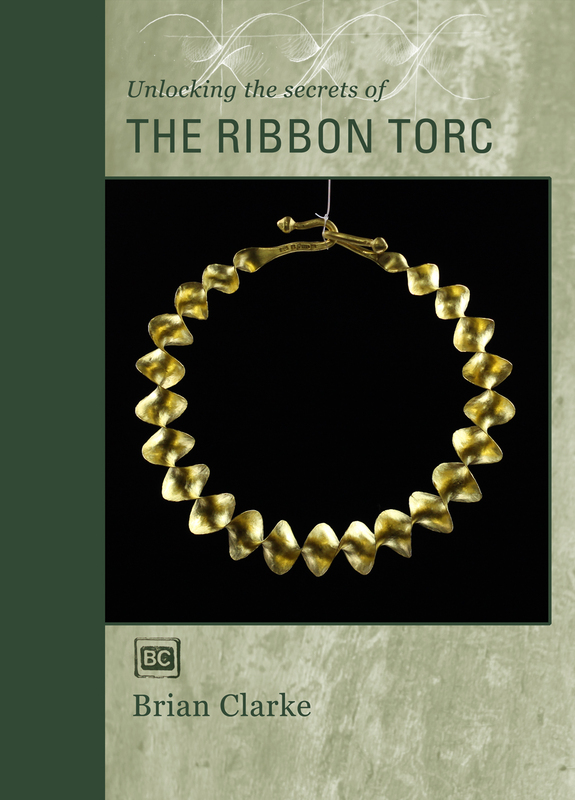 In this detailed book and DVD, Brian explains his process of the making of a gold ribbon torc using the tools and technology of the early Iron Age. There is a short trailer from the DVD below. TO PURCHASE THE BOOK & DVD see below. The price is €40 (plus shipping) for the book and DVD. To purchase, please use PAYPAL with info@ribbontorc.com or phone +353 86 3432907. email me with your postal address. Shipping charges are as follows: Ireland €8.00, UK €9.00, Europe €10.00, Rest of the World €12.00. From the Introduction to ‘Unlocking the Secrets of the Ribbon Torc. ‘In Ireland we have always had great pride in the prehistoric gold collection exhibited at the National Museum of Ireland. The magnificent lunulae, torcs, bracelets and collars are admired for their beauty and skillful workmanship. However in the enclosed atmosphere of the museum they may feel very remote from the people and places where the work of making the artefacts took place. There may be questions about how, who, when and where, but the answers might not be there. When we begin to think about how a gold ornament such as the beautiful ribbon torc from ‘near Belfast’ was made we find that the information is sometimes in short supply. Archaeology is a way of looking at the world in the past to understand how people lived in periods and places both distant and local. It is a curious study because it is very dependant of the contribution that other forms of knowledge can make to our understanding of the past. Almost every other branch of learning and the applied arts and sciences elucidate the sometimes partial information that archaeology itself produces. Even in the best archaeological circumstances it is rarely possible to follow the whole process of production through from beginning to end. At least up to the publication of this book that was the case. The book you are about to read will change your perception of the ribbon torc as a simple piece of twisted gold band forever. over many years of thinking and consideration, melting and annealing, Brian Clarke has worked through many technical challenges and frustrations that his ambition to reproduce the form and style of the ribbon torc has presented. Only a goldsmith of exceptional skill and vision could have begun this adventure in re-imagining and rediscovering the ancient techniques and only one with exceptional patience and fortitude could have seen it through. While Brian was working his way through copper, silver and gold forms, defining and refining the technique of anticlastic raising, archaeologists too were considering the ribbon torc and attempting to resolve the chronological conundrum that they represented. Advances in recent years i our understanding of the chronology of Irish prehistoric gold work mean that we can now assign most ribbon torcs and in particular, the tightly would spiral type, to the Iron Age. It was assumed previously to belong, with the vast bulk of gold from Ireland, to the Bronze Age. Based on the re-interpretation of the relative quantities of gold, silver and copper it is now possible to assign gold objects to broad chronological periods from the early Bronze Age to the Iron Age. The type of gold used in Ireland in the Iron Age is rich with silver, with up to 25%-30% present. This alloy characterises gold in Ireland during the Iron Age. Te source of this gold is not known and it may be either an naturally occurring ore or a man made alloy. The discovery in 2009 of a hoard of two ribbon torcs and two other torcs clearly of Iron Age type at Blair Drummond, Stirlingshire, Scotland, has settled the dating. Mary Cahill, Keeper of Antiquities, National museum of Ireland.